Discussion in 'Exploring everything under the sun!!' started by Stic-o, December 9, 2004. This is the greatest thing ever....and I want one! Too cool, this is right up my alley for a shop assul on my co-workers!!!! Lil safer than my potatoe cannon! If I get some extra dough for Xmas, I might just pick one of those up. Optional laser sight! What size marshmallows does this thing shoot? If it shoots the regular sized then I want one! Lets see, I've got my ABS lime launcher (potato gun), my PVC water guns, always wanted to make one of those PVC flame throwers. 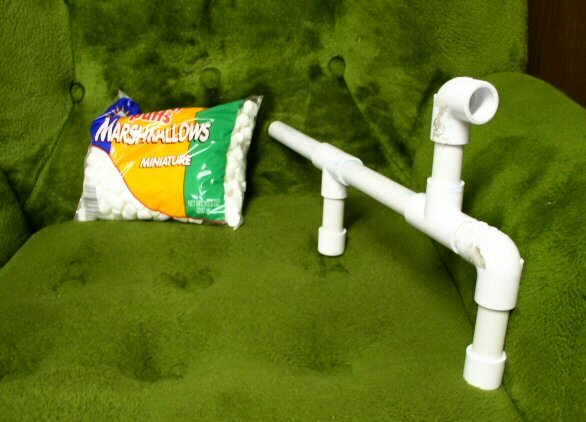 I think a PVC marshmallow gun would fit right in. The PVC one is shown with miniatures. . .but I'm not sure how that works with 1/2" pipe. . .it'd just be loose in there. Not to mention, what if it decides to go down one of the T's the wrong way.